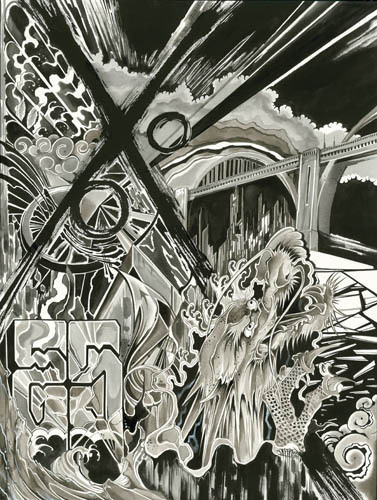 Alex Kizu, Resurgence, 2008, ink on paper, 24 x 18”. This exhibition may initially appear as yet another street art show, but it was, in actuality, announced six months in advance of the Los Angeles Museum of Contemporary Art’s major gathering “Art in the Streets.” It also fills a vital gap in Jeffrey Deitch’s extravaganza: the social and cultural legacy of Los Angeles, where cholos marked territory with elaborate placas (plaques) as early as the mid-1930s, predating the explosion of style writing on New York subways by more than three decades. Curated by Steve Grody, author of the 2007 book Graffiti LA, and Shirlae Cheng-Lifshin, this exhibition includes large and vivid paintings as well as a handful of collages and sculptures by thirty-one Los Angeles­–based artists. “Street Cred” is by no means a historical show, but the roots of local street art––particularly from East LA––are evidenced throughout. Some artists, such as Saber, Man One, and Codak, transform the gothic-style letters of earlier decades into elegant and dimensional forms that veer into abstraction. Others, including Alex Kizu, Retna, and Paul Kanemitsu, invoke placas but suggest influences ranging from Japanese calligraphy to ancient hieroglyphics. Grody’s photographs of the artists’ work on the streets of LA are included alongside pieces in the gallery, preserving the authenticity of their distinct contexts while allowing connections to be drawn. For most of the artists, the movement from street to studio has been lateral, as exemplified by Chaz Bojórquez, whose influences include cholo writing and Asian calligraphy. But for some, such as Juan Carlos Muñoz Hernandez, who moved from Boyle Heights to Venice to apprentice with the late Robert Graham, graffiti was an entryway to working in acrylic, oil, and bronze. In contrast to popular interest in graffiti art, which tends to emphasize the dark glamour of gangs, drugs, and sundry illegality, what stands out in “Street Cred” is a depth of commitment to the formal, social, and communal possibilities of art, both in the gallery and on the streets.